Another sort of mish-mash post. I realized I forgot to blog an entire weekend of ministry, and we’ve had some fun stuff with the kiddos too. First, we started the month really well with an awesome cardiology visit for Noah! As many of you know, he had some pretty serious complications after his open heart surgery, but he’s been steadily improving, and this time they gave him the all-clear for six months! The difference in him is simply amazing since the surgery! When we first met him (you can read about there here), he was very sick. He would turn blue with any kind of exertion, and when we brought him home, he would have to rest holding onto the handrail halfway up our stairs before he could finish climbing the flight to get up to bed. To see him now is to see a miracle! He even did a walk/run event at school and he went 5.5 MILES! It’s truly amazing, and it’s so fun to watch him realize that he doesn’t have those same limits that he’s lived his whole life with anymore. We are so grateful! We also decorated for Christmas which was a first for Noah. It’s been fun for all of us to explain what Christmas is (and what it isn’t! Shout out, Santa!) and to be reminded ourselves of all those truths. 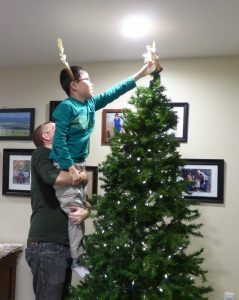 Noah got to put the angel on the top of the tree. My favorite quote from him as we were putting all the decorations up was, “Hmm, so Americans just put these big socks on the fireplace for Christmas? Okaaayy.” Pretty funny! 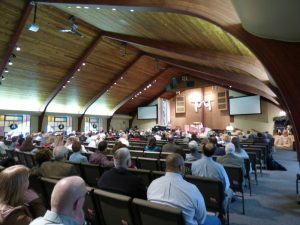 I had a great weekend of ministry in Pennsylvania at the Church of the Open Door the first weekend of December. It was great to be with this church – I had done their women’s retreat a couple of years ago, but that was at a camp, so I’d never actually been to their church building. It was so fun to reconnect with some of the ladies from the retreat, and we loved working with Sally the women’s director, and also getting to stay with Lorraine, the women’s retreat director – she and her husband were so lovely to us! 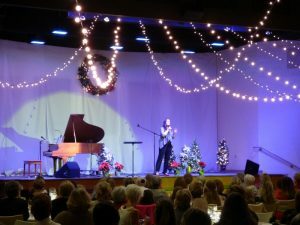 The church has done a Christmas outreach event for years for their women, and it’s become so popular that they kept selling out, so this year they had identical events on Friday night and Saturday morning instead. I think it was a great success for them – they were able to get many more people in that way, and while I know they were so tired afterwards, we heard from many women who met the Lord at the events! 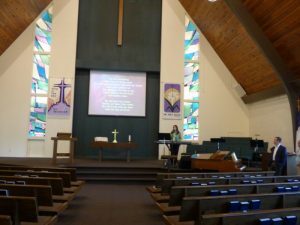 On Sunday I stayed and did special music on their services as well. I love the heart for people at this church. They really value reaching out and loving on people! I got home from that event, and then flew out the next day to Chicago and then onto Freeport. I did another Christmas event for the women at Broadway Covenant. This was a little bitter sweet for me. I love the people at Broadway – I was there last spring, and they were just so lovely and warm. But this is where Donna is from (my former assistant who passed away this fall) and we were there together last time. Her best friend, Kim, came to the event, and Donna’s husband, Larry, happened to be in town visiting family and surprised me by coming too! It was so good to see them, but we were all remembering Donna, and it was an emotional evening for me. God is good, and I think the message was really used by Him for the women at the event, and also for Larry and Kim and for me. He is such a comforter. 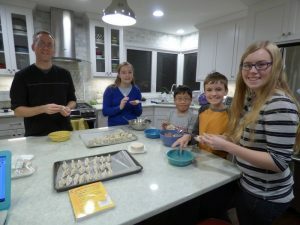 Part of learning the culture – dumpling making party! Everyone helped! It’s hard for me to believe that it was just about two years ago now that Nathan and I started talking seriously about adoption. At the beginning of our search, we were really open to going anywhere in the world. We were just praying. The one thing we both felt, though, was that we wanted to adopt older kids who would have difficulty being placed. At first we were looking for a sibling pair. We felt it would be easier not to be the only child in your family who was adopted or a different ethnicity. We were actually looking for a healthy, older sibling pair in Uganda when I first saw Noah’s posting. 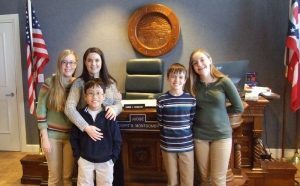 That’s a beautiful story that you can read here, but the end of it was that we switched from looking for a healthy, older sibling pair in Africa, and instead adopted a very sick, single boy from Asia. From the moment we decided to pursue Noah, we both felt he was not going to be the only one. Again, we feel like it would be very hard to be the only adopted kid in your family and we also had already prepared our hearts for more than one child. With Noah’s heart situation and all the unknowns about his health and future, it wasn’t practical to think about adopting two at once. But I knew that if his heart was still operable, we’d be moving forward fairly soon. There are some real advantages to moving on to another adoption within a year as you can reuse some of your paperwork and update your homestudy rather than doing an entirely new one. So after Noah’s heart surgery, I started looking again on the boards that list waiting children. These are the special needs kids and the older kids – the ones who have a hard time getting placed. One major difference for us this time was that we knew we were going back to China. I thought culture would be a huge issue for us since Noah was older, and I was right! Noah misses his food, his TV shows, his holidays, and we have learned a ton about Chinese culture. I feel very strongly that he should get to keep that – he has had an incredible amount of loss in his life. So I’ve learned to make a lot of Chinese food, we’ve celebrated Chinese holidays, and I’ve learned to navigate a lot of Chinese websites. We can do this with two cultures, but I just didn’t think I could manage to do justice to three. So unless God told us otherwise, we planned to go back to China. There’s a Facebook page where people advocate for waiting children in China. I am on it and it moves really fast, meaning that if you see a posting, it may be pushed so far down the page an hour later that you can’t really find it again. Some of the kids show up over and over again as their advocates work hard to find them a family, and some appear once and then are gone. One day I was on Facebook and I saw a posting for a little boy whose agency name was Carter. I really couldn’t believe what a perfect fit he looked like for us. He was two years younger than Noah so he fit in birth order, he likes the same things the boys like, and he was just adorable! I clicked on his video link, praying even as I did so. There’s always that thought: we want the child God wants us to have, but Lord, you will have to help me recognize him! There are so many kids waiting. How will we know which one God means for our family?! Well, as I was praying that very thing and his video came up, I noticed something immediately. He was wearing a name tag that said “Carter” but it also said his Chinese name. 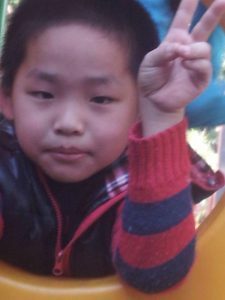 Chinese names have three parts usually, and this boy shared two names with Noah. I could hardly believe it! What are the chances?! It was like God was giving me a confirmation right there. 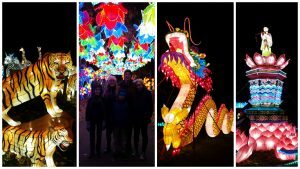 Noah’s Chinese name means “precious dragon” and this boy’s name means “serene dragon” or “peaceful dragon.” His last name was the same as Noah’s first – “precious.” His personality in the video was just amazing – such a perfect fit for our family. He was waiting because he was older and had had physical delays as a baby. I have no idea why, but his orphanage never did his paperwork, so he didn’t even have a chance to be matched until he was 7, making him an older boy which is one of the hardest matches there is. Well, we fell in love, but he was with another agency. I decided to send an email just in case, but we never thought we’d hear anything. He disappeared from that board in about 10 minutes and I never saw him again. Fast forward two months. We had not seen any children we felt fit with our family well considering ages and needs, and we had just decided to tell our agency what we were looking for and leave it in God’s hands. If it happened, it happened, and if not, we would wait until we got Rinnah settled in college (she leaves fall of 2017) and then try again. I even said to Nathan, “We should just stay with our agency because of the paperwork. Unless by some miracle we heard about that boy Carter, but I’m sure he’s matched by now.” The next day I got an email. Another family had been matched with Carter, but they had had a family emergency and couldn’t proceed. Carter’s agency had several interested families, but they thought ours was the perfect fit. Were we still interested? We had 24 hours to decide. My goodness, that was crazy! We made an emergency call to our pediatrician to try to have someone look over his medical report. We asked for one more day, and they gave it to us. We prayed hard and decided that even though the paperwork was going to be overwhelming yet again, this was our boy. We submitted our letter of intent to China for him, and after 4 long weeks, we got the official pre-approval! So, now we are in process again. We’ve almost completed our home study update, but it was complicated by the fact that Rinnah turned 18 this fall, so she now has to be treated as an adult in our home and get all the background clearances, etc, too (lucky girl!). Our next step will be to apply to the US government for permission to adopt from overseas again. There are many other steps after that, but we hope to keep things moving and be traveling to get him in the summer. Even though his hometown and Noah’s home town are 1200 miles apart, they speak the same dialect which is amazing, and it will be so different to have a built in translator this time in Noah! We don’t know what American name we will give him. We like Carter, but all our other kids have Biblical names with big meanings so we may need to go another route. With Noah, we gave him his American name and kept his Chinese name as his middle name so he could choose. These kids have lost so much, we didn’t want him to have to lose his name too! Noah chose to go by his American name because he likes it and because he realized no one except our Chinese friends can say his name correctly here. 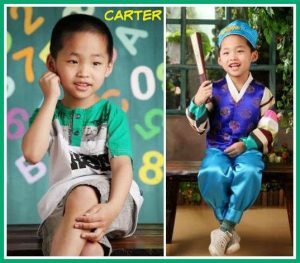 We will give “Carter” an American name too and keep his Chinese name and let him choose. Everyone is asking if we’ll all go again, and the answer is, we have no idea. 🙂 It depends on what time of year we get permission to travel and how expensive the tickets are, etc. With Noah, it was the most amazing blessing to have us all there to bond, but his province required us to be in country for 3 weeks. We didn’t want to leave our other kids that long, and we wanted them to know their new brother’s culture. “Carter’s” province only requires a 9 day stay (praise God!) which will save us so much money, and makes it possible to think about both bringing the kids and leaving them here. So we don’t know, but we’d love your prayers for wisdom! Noah will almost certainly come, though, because he is longing to see China again (and eat the food!!!!) and because he can translate for us which will help “Carter’s” fear tremendously I would think. Back when we were in the hospital with Noah, he said to me, “Our van has eight seats, mom, and we only have six people in our family.” And I said, “That’s true, hon.” And he said, “There are so many more kids in China who need families.” Oh, my heart! When we asked Noah what he would tell his new brother when they met, he said, “I will tell him this family is crazy and funny and very good and he shouldn’t be afraid because we are good. And I will tell him the food is good too.” That about sums it up for a boy, I guess!